Select Length Full Sheet 1" 1 1/2" 2" 2 1/2" 3" 3 1/2" 4" 4 1/2" 5" 6" 7" 8"
Select Width 12" x 24" 16" x 32" 1" 1 1/2" 2" 2 1/2" 3" 3 1/2" 4" 4 1/2" 5" 6" 7" 8"
Our crystal clear acrylic stamp mounts work great with your cling mounted stamp dies. 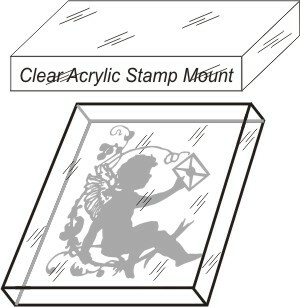 You can see right through the mount to the surface being stamped! 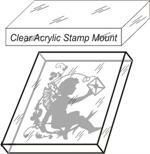 Sticky polymer dies will also adhere for your customer's stamping pleasure. A wide variety of sizes to select from. 3/8" thick and precision laser cut to size. Custom dimensions and shapes are available on request. America's Favorite Polymer Exposure Unit! Take the Effort out of Washing Polymer Plates!